We have hand picked each item in the Interior Brushes Kit because they are highly effective when paired together. To create the best kit possible we utilize our years of detailing experience, combined with input from some of the best detailers around the country. We are confident you will get outstanding results with each item and really enjoy how your vehicle looks afterward. Save $13.91 off of the retail price of individually purchasing these items! DI Brushes Leather and Vinyl Scrub Brush - outstanding leather care brush to deep clean leather! 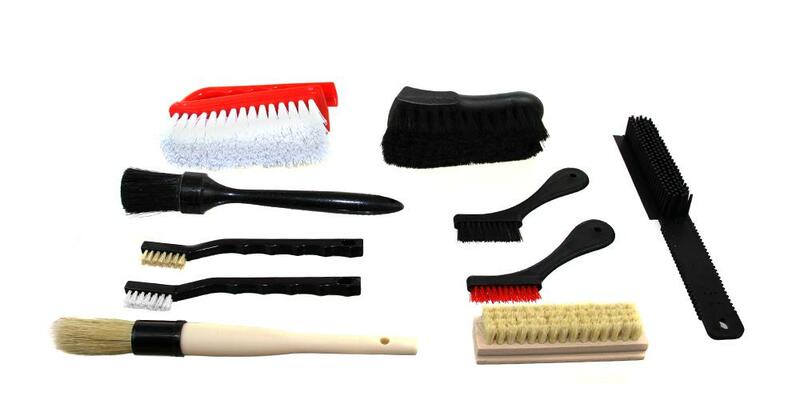 DI Brushes Scrub Brush - great for deep cleaning carpets, mats, fabric convertible tops, fabric seats, and more! DI Brushes Toothbrush Style Detail Brush (Horse Hair) - remove dirt and debris from small seams and crevices safely and easily! DI Brushes Toothbrush Style Detail Brush (Nylon) - remove dirt and debris from small seams and crevices safely and easily! Well worth the price. Great combo of essential brushes. I am currently starting a small detail business and I don't find myself absolutely needing any other brushes so far. The boars hair detail brush is great quality and my favorite of the kit, but all brushes are great quality and again, well worth the price when starting. This kit is awesome! It has everything one would need! This kit is just what I needed for my small detailing business. The rubber pet hair brush is my favorite. Works very well! Your customer service is phenomenal. Next time I need more products I will surely order from you again. Thank you so much!